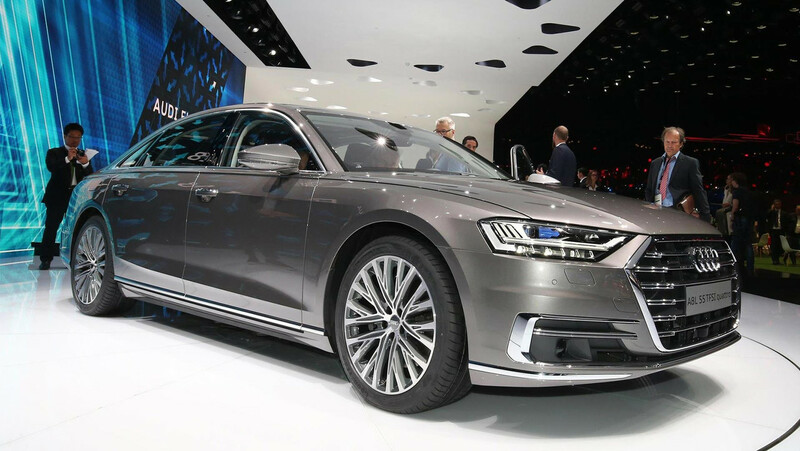 Audi says the new 2018 A8 represents the future of the luxury automobile class. After numerous teasers and spy photos, the future is now upon us and if we’re honest, it doesn’t look that much different than the past. It’s a little bit bigger overall, and it comes in 12 exterior colors including three all-new shades, but it’s a conservative approach that we suspect most Audi followers will appreciate. However, that’s not to say there isn’t plenty of futuristic bit contained within the new package. The biggest difference outside is the automaker’s new Singleframe grille, accented with additional tweaks to the front and rear fascias. Among those tweaks are new lasers (yes, lasers) within the HD Matrix LED high-beam headlamps. No, you won’t be able to pull a Spy Hunter and blast cars off the road, but the laser system does effectively double the range of high beams at speeds above 43 miles per hour, which is when the system activates. Lasers are cool, but it’s inside where the A8’s claim to the future begins to make more sense. The flagship gets a new virtual cockpit with a digital instrument cluster that displays key vehicle information in full HD resolution of 1,920 x 720 pixels. The 10.5-inch center infotainment screen is nearly flush with the dash, but perhaps the biggest difference is a surprising lack of buttons and knobs compared to the current A8. Audi’s new Multi Media Interface relies more on the touchscreen and voice commands to access various functions, though main functions can still be accessed through steering wheel controls. Aural and tactile feedback helps drivers know when commands have been entered and executed. And there are a lot of commands. Audi says the A8 has 41 different driver assistance systems, and the MMI can be configured with six different user profiles with 400 different functions. Just a few of those include a “smart” navigation system with a self-learning function, adjustments for the optional head-up display, connecting smartphones, configuring the bevy of cameras and sensors, adjusting the audio system which includes 3D sound available for the first time in the rear, and oh so much more. Yes, that also includes the relaxation seat available only in the long-wheelbase A8 L. Relegated to the passenger side rear, the relaxation seat provides various heating/cooling and massaging functions as well as a footrest that also includes foot massaging functions. Luxury, indeed. Also among those settings is the A8’s much talked about autopilot system. Audi is the first manufacturer to use a laser scanner (yes, more lasers) in conjunction with radar and other sensors to get a layout of the surroundings. As such, the manufacturer says it’s a highly automated system that will let drivers be completely hands-off in slow-traffic situations on divided highways. As long as speeds remain under 37 mph, the A8 can handle the rest. In parking situations, the A8’s autonomous system can maneuver and park itself in a garage or space without the driver even being in the car. The system can be activated by a smartphone and monitored by the driver from a remote location. 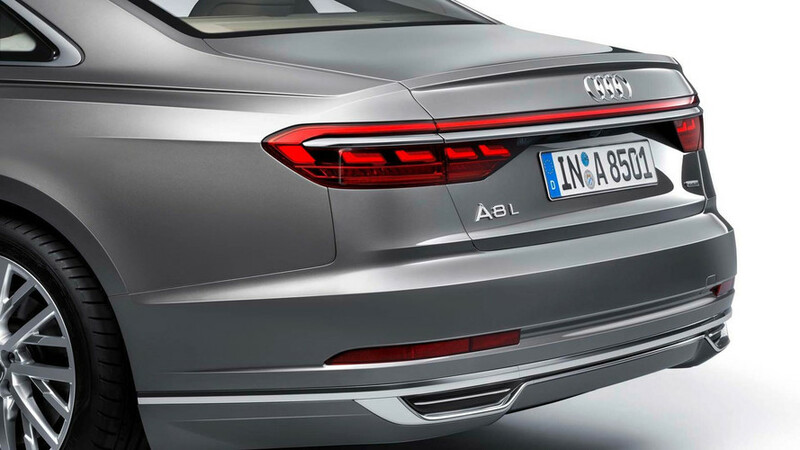 The big news on the mechanical front is that every single A8 is now a hybrid. The car will launch with a pair of turbocharged V6 engines – a 3.0-liter TFSI petrol mill good for 340 horsepower, and a 3.0-liter TDI diesel with 286 horsepower. Each will work with a mild hybrid system that can let the A8 coast for up to 40 seconds without the engine engaged, at speeds from 34 to 99 mph. The system also allows for slow-speed operation as well as start-stop functionality. Audi says 4.0-liter V8 engines for both gasoline and diesel power will be coming in the future, as well as a W12 model and e-tron plug-in hybrid. The A8 will dispense power to all-four wheels through a newly developed eight-speed tiptronic automatic. Audi’s new active suspension is also of some interest. Billed as AI active suspension, it incorporates an electric motor and numerous other components for each wheel, allowing the system to adjust suspension load independently. As a result, Audi says the A8 can have the isolated compliance of a proper luxury sedan, with the agile stance of a sports car. That’s a feature we’ll be very keen to investigate on our own. The new 2018 Audi A8 will launch this fall in Germany, but the future doesn't come cheap. The V6 model opens with a starting price of €90,600, with the A8 L costing €94,100. That translates to $103,000 and $107,000 in U.S. dollars – a far cry indeed from the A8's current $82,500 base price. Time will tell if lasers and advanced self-driving modes are worth the price of admission. 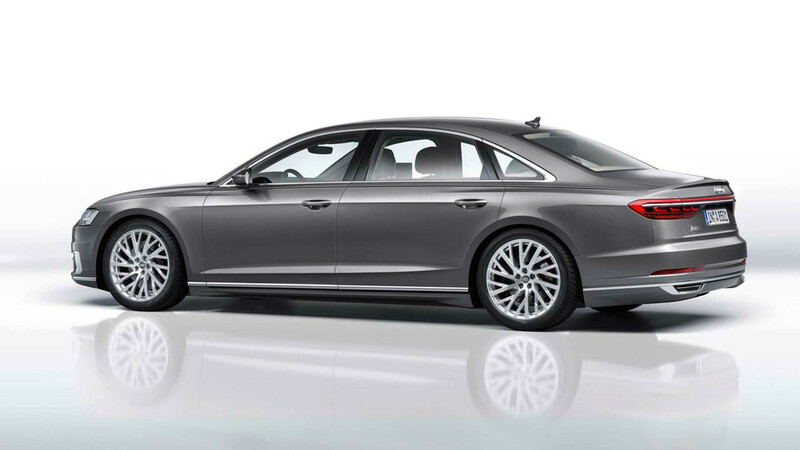 The new Audi A8 presents the future of the luxury class. In its fourth generation, the brand’s flagship model again provides the benchmark for Vorsprung durch Technik – with a new design language, an innovative touchscreen operating concept and a systematically electrified drive. The Audi A8 is also the first production automobile in the world to have been developed for highly automated driving. From 2018, Audi will gradually be taking piloted driving functions such as parking pilot, garage pilot and traffic jam pilot into production. 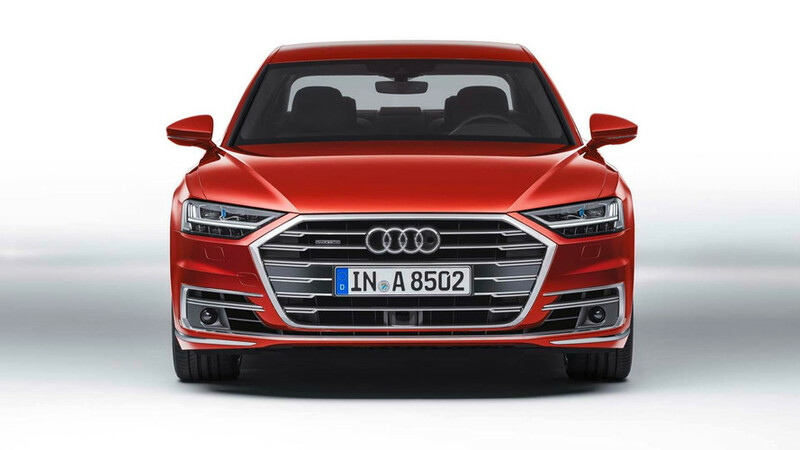 Doyen of style: the exterior design The Audi A8 is stylistically defining – it signals the dawning of a new design era for the entire brand. The front end with the wide, upright Singleframe grille and the fluid, muscular body symbolize sporty elegance, sophistication and progressive status. The new A8 delivers on the promise made by the Audi prologue design study. The luxury sedan possesses a powerful presence – whether in the 5.17 meter (17.0 ft) standard version or the A8 L, which has a 13 centimeter (5.1 in) longer wheelbase. Freedom is the defining design feature with a new luxury slant. 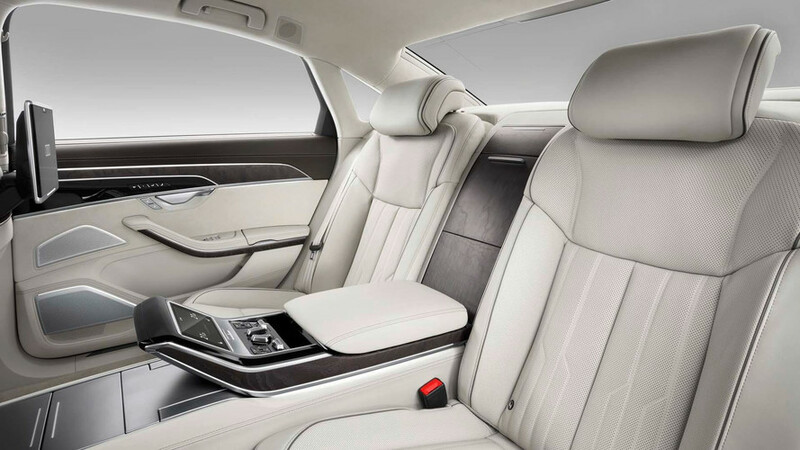 This explains the A8’s resemblance to a lavish, spacious lounge. Compared to the predecessor model, it has grown substantially in length in both body versions. The range of equipment and materials is extensive, with every detail radiating superlative bespoke quality – from the perforation in the seat upholstery to the electrically opened and closed shutters on the air vents. The user interface appears as soon as the car is opened. The driver controls the Infotainment system with fingertip control on the large display. They can use a second touchscreen display on the center tunnel console to access the air conditioning and comfort functions as well as make text inputs. While doing so, they can rest their wrist comfortably on the wide tiptronic selector lever, for extra ease of inputting a navigation destination, for example. When the driver activates a function in the upper or lower display, they hear and feel a click by way of confirmation. The glass-look operating buttons respond in the same way. The combination of acoustic and tactile feedback along with the use of common touch gestures such as swiping make the new MMI touch response especially safe, intuitive and quick to use. The extensively optimized navigation is another new feature: It is self-learning, based on the route just driven. This provides the driver with intelligent search suggestions. The map also incorporates highly detailed 3D models of major European cities for a more realistic representation. The latest version of the Modular Infotainment Platform, the MIB 2+, serves as the control hub for all these functions. It integrates a cutting-edge K1 processor by the Audi venture partner NVIDIA. A second K1 chip generates the graphics on the Audi virtual cockpit, which as the digital instrument cluster offers a full HD resolution of 1,920 x 720 pixels. And the Bang & Olufsen Advanced Sound System delivers a new spatial experience: for the first time the rear seats are included in its fascinating 3D sound with height information. The music unfolds exactly how it was recorded in the concert hall. It draws on an algorithm that Audi has developed jointly with the Fraunhofer Institute. It is matched by a new standard of telephony in the A8 thanks to Audi phone box with Voice over LTE – a standard the user will experience both in operation and in the sound and connection quality. The Audi AI remote parking pilot and the Audi AI remote garage pilot steer the A8 independently into and out of a parking space or garage, monitored by the driver. The driver need not be sitting in the car. They start the appropriate system from their smartphone using the new myAudi app. To monitor the parking maneuver, they hold the Audi AI button pressed to watch a live display from the car’s 360 degree cameras on their device. Once the maneuver has been completed, the system automatically engages the tiptronic P position and switches off engine and ignition. The second new technology, Audi AI active suspension, is a fully active suspension system. Depending on the driver’s wishes and the driving situation, it is capable of raising or lowering each wheel separately with electric actuators. This flexibility imparts the driving characteristic with huge latitude – ranging from the smooth ride comfort of a classic luxury sedan to the dynamism of a sports car. In combination with pre sense 360°, the car is raised with lighting speed if there is an impending lateral collision, reducing the potential consequences of the accident for all occupants. This highly innovative suspension system obtains the energy it requires from a 48-volt electrical system. Audi now for the first time fits it as the primary electrical system in all model versions of the A8. In conjunction with the advanced air suspension for the A8, the innovative suspension concept delivers an utterly new driving experience. Shape. Shift. Sense. Space. These four terms summarize the new Audi A8 with all its characteristics. Shape denotes the aesthetic qualities that the customer sees and feels – the exterior and interior design, the lighting, the colors and materials, as well as the traditional craftsmanship with which they are worked. Shift describes the new level at which the Audi A8 operates. This means the engines, the power transmission, the suspension and also the functions that come under the umbrella of Audi AI – the traffic jam pilot, the (remote) parking pilot and the remote garage pilot. Sense stands for connectivity. The term refers to the MMI touch response operating and display concept including voice control, and to the electronic intelligence used by everything from sensors and control units to assistance systems. The topics of Infotainment, Audi connect key and personalization are another focal area. Finally, Space describes the dimensional concept for exterior and interior as well as the array of comfort solutions for air quality, seating, sound and telephony. Audi has fundamentally reengineered the A8 in its fourth generation. With its stylistically defining design, top-rate suspension solutions, touchscreen operating concept and superlative comfort, the luxury sedan demonstrates Vorsprung durch Technik right across the board. One of the top innovations is the Audi AI traffic jam pilot, which no other competitor offers. Sports appeal, lightweight construction and quattro – the design of the new A8 perfectly conveys Audi’s fundamental values. It embodies sporting elegance, sophistication and progressive status. The new flagship model takes the brand into a new design era. The hexagonal Singleframe grille dominates the sedan’s upright front end. With its low position and width, it determines all adjoining lines and surfaces. The headlight shapes merge perfectly with the Singleframe. With the optional HD Matrix LED headlights, the daytime running lights are a visual extension of the grille’s top lamella. The segmented light signature divides the headlights horizontally, creating an elegant overall impression. Substantial chrome frames surround the air inlets, with a flat center inlet connecting them. The side view with the coupé-like silhouette highlights the sporty character of the new A8. Its proportions accentuate both the front and rear wheels – prominent muscular shapes above the wheels are pointers to the brand’s quattro DNA. The low shoulder line starts right up at the headlights and runs across the door handles as far back as the rear lights. A fold below the window capping also emphasizes length. The sill rises to the rear in typical Audi style and lends the new A8 a dynamism worthy of a luxury-class car. The rear end is inclined slightly in the direction of travel, appearing to push the sedan along even when stationary. The defining element of a lighting strip extends across the entire width. It radiates high intrinsic value thanks to the embedded chrome strip. The segmented OLEDs adjoin at its ends and combine to form a signature. Another chrome strip in the lower part of the bumper integrates the trapezoidal trims of the exhaust system. There is a choice of twelve colors for the A8, including the new Audi colors Terra Gray, Vesuvius Gray and Seville Red. The colors Impala Beige and Navarra Blue are available for the A8 for the first time. Via the Audi exclusive program, customers can also have the luxury sedan supplied in a color of their personal choice. For those who want their car to create an even more striking visual impact, there is the option of a chrome exterior package. 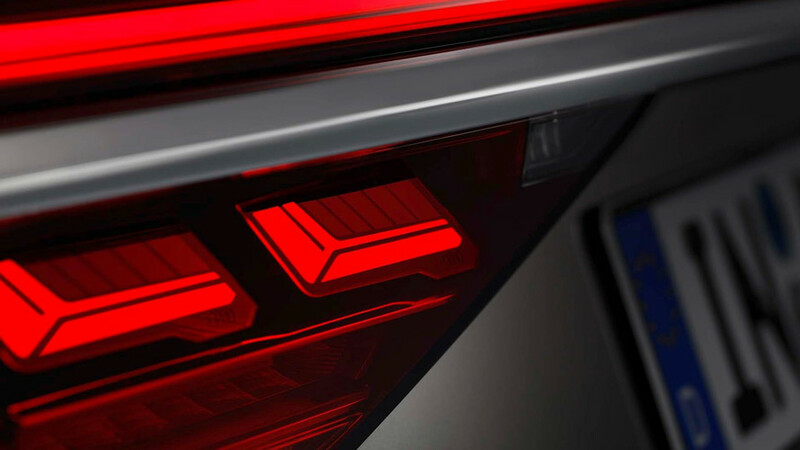 Audi leads the way in lighting technology and design. In the new A8, the technologies interact intelligently with the surroundings. For example, Audi laser lighting is used here for the first time with HD Matrix LED high beams. The laser spot is identified by an X-shape shutter and is also accentuated by blue ambient lighting. The daytime running lights with the vertical segments emphasize the technical elegance of the headlights. The laser spot is activated from a speed of 70 km/h (43.5 mph) and doubles the range of the high beam. Each HD Matrix LED high-beam unit consists of 32 small, individually controlled light-emitting diodes that project the light in two lines. This new configuration ensures that the A8 provides even more dynamic and precise illumination together with the variable-control low-beam headlights. The light cone blanks out exclusively other road users, so as not to dazzle them. The high-precision control for the HD Matrix LED high beam is based on data supplied by the front camera. Cornering light is produced by displacing the light’s focal point. It uses the navigation data to shine into a bend just before the steering is turned. The junction light equally comes on predictively just before a junction is reached. The segmented turning light also comes on dynamically in three stages up to a maximum angle of 90°. With all its functions complete with dynamic turn signals, each HD Matrix LED headlight incorporates 138 LEDs and one high-performance laser diode. The innovative automatic lighting prevents incorrect operation and is controlled from a new light switch module with proximity sensors and touchscreen surface. Together with the high-end headlights, Audi supplies OLED rear lights that emit extremely smooth light. There are four ultra-flat OLEDs floating in each module, sub-divided into four individually controlled segments. Two on each side form the angular tail lights, and the other two act as the brake lights. Below the OLEDs there is also an LED light strip that adapts to ambient brightness when the brakes are applied. The same goes for the dynamic turn signal lights positioned directly below them. There are 135 light-emitting diodes in operation in each rear light. The lights give the new A8 exceptional presence at the very first glance. This is substantially down to the animated dynamic lighting functions. They present the luxury sedan in a unique manner when it is unlocked with the remote control key. First a point of light in the headlights runs from the outside inwards, then the blue LED on the laser spot lights up, and finally the side lights come on from the inside outwards. Two loops with the same dynamic aesthetics run in parallel in the OLED rear lights: The light runs in a circle, initially dimmed and then at full brightness. The light presentation continues inside when the door is opened. This is accompanied by a short audio jingle. When the driver locks and leaves the new A8, the light presentation in the headlights and rear lights runs in the opposite sequence. A new dialog between technology and aesthetics – the interior of the A8 presents a comprehensive spatial experience. The architecture blends seamlessly with the new operating concept, which has virtually eliminated buttons and controls. The clean, expansive surfaces convey the relaxed atmosphere of a luxury lounge. Tranquility and reduction are fundamental aesthetic values in the brand’s new flagship model. Inside the large sedan, the lines flow elegantly and create clear, horizontally oriented volumes. They accentuate the freedom that the new A8 offers its passengers. The applications in the sculptural instrument panel are available in a choice of wood veneer or piano finish and create the wrap-around – the large arc running across the door trims and into the rear. This zone accommodates the air vents, which are concealed by shutters when inactive. If the automatic air conditioning is set directly to the interior, the shutters are slid up and away electrically while the air vents extend out a few centimeters. In the lower section of the instrument panel, the central 10.1-inch touchscreen display with black panel technology blends almost invisibly into the high-gloss black trim. Depending on the equipment, it is in slate gray with a technical structure or in dark, matt-brushed aluminum. On the center tunnel console, which continues the black-panel look, there is a second touchscreen display measuring 8.6 inches. The buttons on its bottom edge optionally blend in with the display look to present a continuous touchscreen surface. They provide the user with tactile and acoustic feedback as from a conventional switch. The same applies to the light switches and the controls on the air vents. As an option, two LED light guides each on the center tunnel, instrument panel and in the doors create a fitting lighting atmosphere in the interior. They create contour and ambient lighting with separate brightness and color control as an elegant way of accentuating the design lines. On the A8 L, the backs of the comfort customized contour front seats also incorporate a contour light strip. The newly developed Matrix LED reading lights each with seven LEDs provide optimum illumination. The passenger can precisely control the brightness, size and focus of the light cone with the rear seat remote control. The interior of the new A8 is notable for its authentic materials. Some of the real wood inlays are open-pored and feel natural to the touch. For its leathers, Audi fundamentally steers clear of chrome tanning – its top-quality unique pieces are natural materials tanned with plant-based products, can breathe actively and are hand-crafted. The comfort head restraints are enveloped in soft, velvety Cocoon leather, a new upholstery of the highest grade. The harmony of the materials and their naturalness create a new, contemporary impression of luxury. They radiate craftsmanship down to the finest detail, giving them bespoke character; the same applies to the perforation in the seat upholstery. There are eight material and color schemes in the new A8, culminating in Audi design selection. For the upholstery, the choices are Verdi cloth and the leather grades Valetta, Valcona and Unicum. These can be supplied in the new colors pearl beige, metropolis gray and merino gray, for example. On selected equipment items, contrasting stitching adds an extra highlight. In addition, depending on version the instrument panel comes in a two-color design. There are various veneers, ranging from beech and eucalyptus to burr walnut and black piano finish. Finally, those wishing to enhance their A8 to their personal taste will find an extensive selection of other exclusive veneers, colors, materials and leather upholstery and trim in the Audi exclusive program. At its market introduction in Europe, the new A8 will start out with two extensively reengineered V6 turbo engines, a 3.0 TDI with 210 kW (286 hp) and a 3.0 TFSI with 250 kW (340 hp). The two V8 versions will follow: The 4.0 TDI develops 320 kW (435 hp), and the 4.0 TFSI has a power output of 338 kW (460 hp). Also appearing later on is the W12 for the A8 L, developing 430 kW (585 hp). (These vehicles are not yet on sale. They do not yet have type approval and are therefore not subject to Directive 1999/94/EC.) All engines offer supreme refinement, ample performance and high efficiency. The new mild hybrid technology (MHEV, mild hybrid electric vehicle) drives down fuel consumption even further – by as much as 0.7 liters (0.3 US gal) of fuel per 100 kilometers (62.1 mi) in real driving conditions. Particulate filters for the gasoline engines will follow in 2018. Power and spontaneity: the 3.0 TDI and 3.0 TFSI Both V6 engines are high-tech units. The 3.0 TDI develops 250 kW (340 hp) from a displacement of 2,995 cm³. Many areas have been extensively reengineered, such as its very sophisticated thermal management. With 600 Nm (442.5 lb-ft) of torque across a rev range from 1,250 to 3,250 rpm, it develops hefty traction. The 3.0 TFSI with a displacement of 2,967 cm³ develops 210 kW (286 hp) and likewise achieves its peak of 500 Nm (368.8 lb-ft) extremely low down the rev range, between 1,370 and 4,500 rpm. Its exhaust end lies inside the 90° vee, so the short gas paths and the twin scroll charger promote responsiveness. Its combustion principle makes the V6 gasoline engine especially efficient. To support it, the Audi valvelift system (AVS) adjusts the intake valve opening times and stroke in two stages based on demand. Even more performance is on tap with the two four-liter, eight-cylinder engines that are to follow in 2018 – the 4.0 TDI with 320 kW (435 hp) and the 4.0 TFSI with 338 kW (460 hp). They share fundamental technical principles, such as biturbo technology and the Audi valvelift system (AVS). When the gasoline engine is being driven with restraint, the AVS deactivates cylinders 2 3, 5 and 8 by closing their intake and exhaust valves. This reduces fuel consumption and promotes efficiency. On the diesel, AVS operates one exhaust valve in each cylinder. It therefore manages the two turbochargers, which – unlike on the TFSI – are switched sequentially. For better filling of the combustion chambers, there is likewise an intake AVS on the TDI. Under load, the 4.0 TFSI develops a characteristically sporty sound that is completely free from interfering frequencies. On the V8 gasoline engine, the e-tron and the W12, Active Noise Cancellation (ANC) eradicates these. The system sends specific anti-noise to the sound system’s loudspeakers. In addition, the V8, W12 and 3.0 TDI are fitted with active engine mounts that inhibit the transmission of vibrations to the vehicle body. They, too, generate out-of-phase counterimpulses – their effect is particularly marked when idling. All engines in the A8 deliver their power to a newly developed eight-speed tiptronic. Not only does it change gear swiftly and smoothly; it also operates highly efficiently. An rpm-adaptive torsion damper (RTD) with a centrifugal force pendulum compensates for undesirable vibrations in the engine. This permits efficient driving from an engine speed range as low as 1,000 revolutions per minute. The improved tiptronic is now for the first time equipped with an electric oil pump – it is activated whenever the large sedan is coasting with the engine off. As soon as the new A8 is coasting and its engine is either deactivated or idling, a clutch in the central transmission is disengaged to interrupt the power flow. For a faster buildup of pulling power, especially after coasting with the engine deactivated, the engineers in partnership with ZF optimized the engagement logic applied in the gearshift process. The transmission control in the new A8 can for the first time recognize stop & go situations. It now modifies the driving strategy with the emphasis on comfort; for example, it avoids unnecessary gearshifts or starting in second gear. The driver can let the automatic transmission do the work automatically in the E, D and S modes, or can take charge of controlling it in M mode. Selector lever commands are all transmitted electrically. Quattro permanent all-wheel drive is standard in the new Audi flagship model. In normal driving conditions, its self-locking center differential distributes torque between the front and rear axle in a 40:60 ratio. If slip occurs at one axle, it directs up to 70 percent of the drive torque to the front and up to 85 percent to the rear. Handling benefits from wheel-selective torque control whenever a committed driving style is adopted. The intelligent software function brakes the two wheels on the inside of a bend slightly before they can begin to spin. Customers can also choose the optional sport differential in conjunction with the two V6 and V8 engines as well as the W12. When cornering dynamically, this redistributes the torque between the rear wheels as required – enhancing traction, stability and dynamics. The driver can view a display of the percentage drive torque per wheel in the MMI of the new A8. Compared with the previous model, the sport differential is around one kilogram (2.2 lb) lighter and offers even faster, higher-precision control. Its management uses the latest generation of the electronic suspension platform (ESP) and is incorporated into the Audi drive select handling system. This allows the driver to experience a range of chassis settings in one and the same car. The operating principle of the participating systems can be set using the comfort, auto, dynamic, efficiency and individual modes. 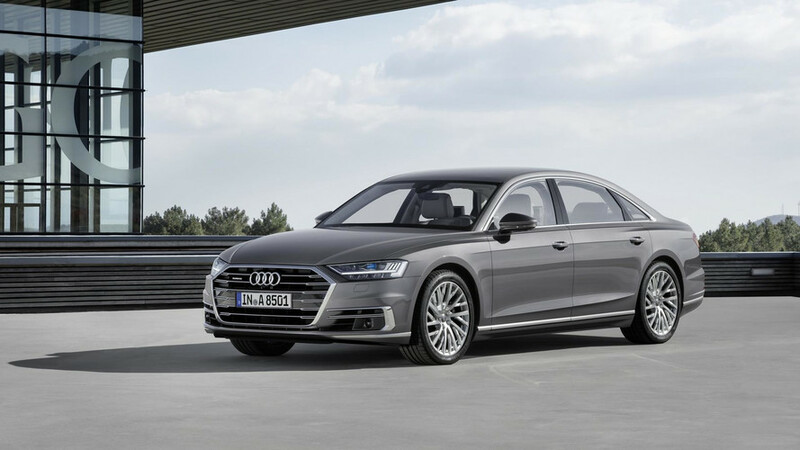 Plug-in hybrid de luxe: the Audi A8 L e-tron quattro A few months after the debut of the new car line, the A8 L e-tron quattro will join the range (This vehicle is not yet on sale. It does not yet have type approval and is therefore not subject to Directive 1999/94/EC.) After the A3 Sportback e-tron (combined fuel consumption in l/100 km: 1.8 – 1.6; combined energy consumption in kWh/100 km: 12.0 – 11.4; combined CO2 emissions in g/km: 40 – 36*) and the Q7 e-tron 3.0 TDI quattro (combined fuel consumption in l/100 km: 1.9 – 1.8; combined energy consumption in kWh/100 km: 19.0 – 18.1; combined CO2 emissions in g/km: 50 – 48*) it is the brand’s third plug-in hybrid model. Its 3.0 TFSI and the electric motor, which is integrated into the eight-speed tiptronic together with the separating clutch, generates 330 kW (449 hp) of system power and 700 Nm (516.3 lb-ft) of system torque. The sprint from zero to 100 km/h (62.1 mph) takes 4.9 seconds, and the top speed is electronically limited to 250 km/h (155.3 mph). The hybrid management takes charge of the efficiency-optimized management of the combustion engine and electric motor. When started, the A8 L e-tron quattro runs in the all-electric mode; the combustion engine cuts in automatically as the situation requires. The active driving pedal with variable pressure point gives the driver feedback on the maximum available power for electric driving. They can select various hybrid modes at the EV button. These comprehensively affect the driving properties – regardless of whether the driver wants to use the energy stored in the battery straight away or save it for later. If route guidance is activated in the navigation system, the predictive operating strategy is also activated. It uses map data plus a new standard of real-time traffic information, and adapts energy management to reflect the route ahead. For example, when driving along the freeway it is possible to protect or even increase the amount of electrical energy stored. This will then enable the A8 L e-tron quattro to cover a city driving route with zero local emissions. The predictive efficiency assistant promotes a fuel-saving driving style by incorporating navigation data, connect information such as traffic sign recognition online, and information from the on-board sensors. The driver sees the recommendations displayed in the Audi virtual cockpit. In addition, pulsating of the driving pedal now draws the driver’s attention to such messages. In conjunction with the adaptive driving assistant (ADA), the car is the only one among the competition to respond to speed limits, bends, junctions and roundabouts without driver intervention, and now slows down or speeds up accordingly. The driver always ultimately always remains in control – whether they choose all-electric driving, which is possible at up to 135 km/h (83.9 mph), or want to use the combined power of the electric motor and TFSI. When the driver takes their foot off the accelerator, the large sedan starts to coast whenever that is the best energy strategy. During moderate deceleration it uses the electric motor as an alternator and therefore as an engine brake. This enables the Audi A8 to recover a substantial amount of energy. The hydraulic wheel brakes are only called upon for harder brake applications. In the tiptronic’s S program, the electric motor provides maximum boost torque to assist propulsion. The market introduction of the A8 L e-tron quattro (This vehicle is not yet on sale. It does not yet have type approval and therefore does not comply with Directive 1999/94/EC.) also marks the debut of Audi Wireless Charging (AWC). This new, convenient charging technology involves a floor pad inducing an alternating current in the secondary coil installed in the car, under the front axle. The magnetic field presents no danger whatsoever – it is only created when the A8 L e-tron quattro is positioned above the pad and the charging process is active. To facilitate parking for the driver, the MMI shows the position of the charging station. Before the charging process starts at 3.6 kW, the pad is raised to reduce the distance between it and the car, and achieve a high charging efficiency of over 90 percent from mains to battery. Alternatively customers can charge the battery of the A8 L e-tron quattro using cables at home or at public charging stations – at 3.6 or 7.2 kW, depending on the connected load. In the latter case, the A8 L e-tron quattro is fully charged from an industrial power socket in about two hours. The driver starts the charging process conveniently from the MMI system. Alternatively they can activate it with their smartphone, using the myAudi app that also enables programming of charging timers. The smartphone also plays an important role in regulating the temperature inside the car. The key component in the automatic air conditioning of the new A8 L e-tron quattro is a heat pump that collects the heat given off by the high-voltage electrical components and provides low-energy heating and cooling. The climate control is highly intelligent. Again using the smartphone app, the driver can specify in detail before setting off how the interior climate should be set. The same applies to the optional steering wheel, seat and windscreen/rear window heating and the seat cooling. In summer, the auxiliary climate control of the A8 L e-tron quattro with electric air conditioning compressor establishes pleasant interior temperatures before a journey. Another option is instant startup of the climate control components as soon as the car is unlocked with the vehicle key. The A8 L e-tron quattro is identifiable from outside by its special daytime running lights and special wheels. Its Audi virtual cockpit and MMI touch display inform the driver of all important drive parameters and of the settings for charging and for e-tron specific climate control functions. A new dimension of flexibility: the Audi AI active suspension Adaptive air suspension already gives the A8 a wide spread of operating characteristics ranging from smooth ride comfort to sporty handling. This impression is heightened engagingly with Audi AI active suspension, which will be available from market launch for the V6 TFSI and the two V8 versions. It is a standard feature on the W12. Audi AI active suspension is a fully active, electromechanically operated suspension system. For each wheel there is one electric motor supplied by the 48-volt primary electrical system. In each case there is also a transmission, a rotary tube housing a titanium roll bar and a lever that exerts up to 1,100 newton-meters (811.3 lb-ft) on the suspension via a coupling rod. Boundaries pushed: dynamic all-wheel steering There is another world first in the suspension of the new A8: dynamic all-wheel steering. It, too, is controlled by the electronic suspension platform (ESP). The new steering system approaches the steer angle and directional stability as separate issues, once again probing the boundaries of the physically possible. At low speeds and on tight bends, the luxury sedan significantly reduces steering effort. But this is never allowed to unsettle it. The A8 is even unruffled by an abrupt lane change at high speed. The driver always feels intensive, finely differentiated feedback from the road. The second generation of the ECP features in the A8. It brings together all signals and data relating to the suspension in a single control unit and offers a new function with the integral driving dynamics controller. It influences the dynamic all-wheel steering, sport differential and active suspension – a new level of integration in the luxury class. The sensors also detect the driving status, such as understeering or oversteering, and the road surface friction. The control unit uses the calculated values to adjust the above components as well as the damper control and air suspension. The customer experiences this in the form of optimum cornering behavior, improved transverse dynamics and ideal ride comfort. The combined algorithms allow faster, more in-depth coordination of the individual systems. Large and powerful: the wheels and brakes The powerful brakes with their aluminum fixed calipers on the front axle also make a big contribution to driving safety. The detail features vary from one engine version to another. For the V8 models and the W12, there is the option of perforated carbon ceramic discs measuring 420 millimeters (16.5 in) in diameter. Each caliper on the front wheels has ten brake pistons, or six pistons on the standard version. Electronic Stabilization Control provides even more precise control than in the previous model. The wheel range starts with an aerodynamically optimized 17-inch wheel, going all the way up to size 9 J x 21 with 275/35 tires. If any of the wheels are not properly tightened, a function integrated into the Electronic Stabilization Control alerts the driver promptly. The loose wheel warning is standard, and unique in the market. Audi AI is the umbrella term for a new generation of high-end assistance technologies extending all the way up to highly automated driving. Three of them will be available for the first time in the new A8 – the Audi AI traffic jam pilot, the Audi AI (remote) parking pilot and the Audi AI remote garage pilot. During highly automated travel a small camera in the driving area detects if the driver tires or falls sleep. If that happens, a multi-stage warning is given. As soon as the speed rises above 60 km/h (37.3 mph) or the line of vehicles breaks up, the traffic jam pilot informs the driver that they need to take charge of driving once again. If they ignore this prompt and the subsequent warnings, the new A8 is braked to a standstill. The introduction of the Audi AI traffic jam pilot means the statutory framework will need to be clarified in each individual market, along with the country-specific definition of the application and testing of the system. The brand’s high quality standards are equally applicable in the realm of highly automated driving. In addition, a range of approval procedures and their corresponding timescales will need to be observed worldwide. Audi will therefore be adopting a step-by-step approach to the introduction of the traffic jam pilot in production models. What is new here is the driver is outside the car throughout the entire parking maneuver. They start the maneuver from their smartphone by pressing the Audi AI button in the myAudi app. To monitor it, they hold it pressed and watch a live display from the car’s 360 degree cameras on their device. Once the parking maneuver is over, the system automatically engages the tiptronic P position and switches off engine and ignition. When ready to drive off, the driver can start their A8 by smartphone and drive it out of the parking space or garage again. If the driver is still behind the wheel, they also have the option of activating the parking pilot using the AI button in the center console. Like the AI button in the myAudi app, they again need to hold it pressed throughout the entire process. The Audi AI (remote) parking pilot and the Audi AI remote garage pilot function intelligently and conveniently. For instance the sedan can also be steered accurately into a garage if it needs to describe an arc. Inside the garage, the A8 can approach very close to the walls and obstructions such as bikes – or it will interrupt entering if there is not enough space for the car. This special function benefits especially from the innovative laser scanner and is not available in any other competitor model. - one infrared camera (night vision assist) on the front. There have previously been several control units, each evaluating the information they pick up for a defined function. Now for the first time, a central driver assistance controller (zFAS) permanently forms a comprehensive image of the surroundings from the sensor data – for a wide range of assistance functions. This is created by complementary sensor systems, plus redundant data fusion in the zFAS and the radar control unit. All assistance systems benefit from the central model of the surroundings – whether adaptive driving assistant, active suspension, park assistance function or traffic jam pilot. Traffic signs are combined with data from a digital map; crossing assist draws on the comprehensive field of activity, as does the emergency braking function, which has been optimized in quality and effect by the redundant design. The zFAS, around the size of a tablet computer, makes its debut in the new A8. It is a high-tech data center that integrates high-performance computers from NVIDIA (Tegra K1), ALTERA (Cyclon V), Infineon (Aurix) and the image processor EyeQ3 from Mobileye, the world leader for image processing algorithms in the automotive context. Audi presents a further world first in the guise of the laser scanner. Mounted in the front bumper, this component roughly the size of a fist emits light pulses on several vertical planes. A mirror distributes them fanned out over a field about 80 meters (262.5 ft) deep and through a beam range of 145 degrees. The wavelengths of the flashes are in the near infrared range, making them invisible and harmless to the human eye. They are reflected by the objects in front of the car and are returned to the laser scanner in far less than a microsecond. There, they are detected by photodiodes. The time this process takes is used to compile a detailed, deeply contoured image of the surroundings. Together with the long-range radar and the front camera, the laser scanner forms a trio of sensors, the various strengths of which complement each other. The laser detects all kinds of objects – including non-metallic ones – with precision and has a wide beam angle. When it comes to those criteria it beats radar, which has a range of up to 250 meters (820.2 ft), a greater height range and persistently delivers readings even in rain and fog. Laser scanners and radar also work in the dark if the front camera comes up against its limits despite the bright headlights of the new A8. In good visibility conditions it produces high-resolution images of the vehicle’s near and mid-range surroundings. Thanks to the image database it is capable of classifying many individual objects, such as automobiles, trucks, cyclists and pedestrians. Deep learning methods are used for the first time by the image processing system. It uses neural networks as part of its self-learning approach when determining which characteristics are appropriate and relevant for identifying the various objects. This satisfies another key condition for progress towards autonomous driving. Thanks to the highly connected sensor technology, the assistance systems in the new A8 also respond even sooner to objects, for instance when they detect the end of a tailback and initiate a brake application – an advance on the previous model. Even the navigation profits from sensor data fusion and enables the sedan to identify its position with absolute precision in many situations. With 41 driver assistance systems, the fourth generation of the A8 becomes the new gold standard. The systems support the driver as desired, whether on the freeway or in the parking lot. They make driving even more convenient, effortless and safe. Audi groups the assistance systems in the three packages Park, City and Tour, with the Tour package standard in Germany. Customers who opt for the Audi AI assist package plus obtain all three packages and also the Audi AI remote garage pilot. The Audi AI Park assist package comprises the Audi AI parking pilot and the wide-angle 360 degree cameras that make maneuvering safer. The driver can have various views of the car’s immediate surroundings displayed on the on-board monitor, to some extent with superimposed guide lines. Maneuvering assist provides steering movements and independently applies the brakes to avert the risk of bumping into static and moving objects. To protect the alloy wheels, the Park package also includes a curb warning. The newly developed crossing assist is part of the City assist package. If the mid-range radars detect critical crossing traffic in front of the car, the system warns the driver and makes a brake application if need be. The new A8 also alerts the driver to risks when changing lanes. The exit warning system indicates vehicles or cyclists approaching from the rear when opening the door. Light guides in the doors indicate the danger optically. Cross traffic assist kicks in if the new A8 is reversing out of a right-angle parking space. Another feature of the City package is the pre sense 360° safety system. It detects collision hazards all around the car and initiates targeted preventive measures – whether a full brake application, adjusting the seats or tightening the belts. The Audi AI active suspension additionally raises the body in the event of a side-on collision, deliberately directing the external forces towards crash-active structures. This new function is called Audi pre sense side and is part of the pre sense 360˚ system. It, too, uses the sensors integrated into the central driver assistance controller (zFAS), including the mid-range radars at the corners of the vehicle with a measuring range of about 75 meters (246.1 ft). The central system in the Tour assist package is the adaptive driving assistant (ADA). It is a progression from the adaptive cruise control (ACC) of the previous model and also integrates a lane assist function and traffic jam assist. This means the driver has support for longitudinal and lateral control over the entire speed range from 0 to 250 km/h (155.3 mph). Bottle neck assist guides the new A8 through construction sites and similar zones. The system in addition promotes an efficient driving style by incorporating navigation data and car-to-X content such as traffic sign information. The A8 is the only model in its competitive field to accelerate or slow down in response to speed limits, bends, junctions and roundabouts without the need for driver intervention, while automatically drawing on route information from the navigation system. To complement the predictive advice in the Audi virtual cockpit, the driving pedal in the new A8 emits pulses. The Audi pre sense front safety system, also part of the Tour package, can prevent rear-end collisions or reduce their severity. It incorporates a warning and braking function for vehicles, pedestrians and cyclists. The system is active over the car’s entire speed range up to 250 km/h (155.3 mph). The Tour package also includes turn assist and collision avoidance assist. Turn assist monitors the lane of oncoming traffic when turning across it, thus helping to avoid a collision with an oncoming vehicle. It also monitors oncoming vehicles turning across the lane of the A8. It is the only model in its field of competitors to feature collision avoidance assist that also offers individual wheel braking as well as steering assistance, for more precise avoidance of obstructions. Camera-based traffic sign recognition and emergency assist, which brings the automobile to a standstill if the driver is no longer able to do so, complete the range. Park assist and night vision assist are available as standalone options. The latter uses an infrared camera to detect pedestrians and larger wild animals at long distances in the dark and warns the driver of their presence. The new A8 adopts a novel approach to infotainment, too. At the top of the lineup is MMI navigation plus, which uses the latest-generation modular infotainment platform. This platform, referred to as the MIB 2+, is state of the art in every respect – computing power, energy efficiency, main memory and graphics. Its core component is a K1 unit by Audi venture partner NVIDIA which combines a quad-core main processor with a 192-core graphics processor. It operates about 50 times faster than the first-generation MIB. MMI navigation plus provides access to the connect services as standard, and is equipped with a phone module. As an option the system can be expanded with the connect data transmission module including Wi-Fi hotspot. This introduces the LTE Advanced standard into the automotive sphere – another world first from Audi. It enables transmission rates of up to 300 MBit/s for downloads and up to 50 MBit/s for uploads, about three times what is currently possible. In addition, mobile phone calls can be conducted with the Audi phone box using the VoLTE (Voice over LTE) procedure. This accelerates phone connections and allows the simultaneous use of high-speed data transmission and high-resolution online voice telephony (HD Voice) where the other person’s voice sounds as if they are having a face-to-face conversation with you. The new A8 becomes part of the cloud with the Audi connect navigation & infotainment services – this is illustrated especially vividly by the car-to-X services traffic sign and hazard information. The new sedan and other current Audi models report speed limits that they have detected with their on-board camera to a server in the cloud. The server processes this information and sends it to other Audi drivers who might benefit from it. The same applies to the hazard information service: Cars warn one another about accidents, broken-down vehicles, slippery road surfaces or impaired visibility. The system does this by analyzing multiple parameters, such as the in-car electronics, data from the rain and light sensors, the headlights and the operating mode of the windshield wipers. The information basis for the new car-to-X services is maps supplied by HERE, a data platform that Audi is continuously updating and expanding in partnership with the BMW Group and Daimler AG. It surveys the world of traffic with centimeter precision and can detect and evaluate events in real time. An array of other services: Audi connect As well as the car-to-X services, Audi connect includes an array of other services such as access to Twitter and the e-mail mailbox or Google Earth navigation. The new hybrid radio service switches seamlessly between VHF, DAB and online stations to find the best reception. It recognizes the current music track and loads context information from the cloud. Online radio provides access to thousands of internet radio stations and podcasts available worldwide. In many markets, the data transfer for the Audi connect services is handled by the Audi connect SIM, which is built into the car. The corresponding data flat rate covers the charges and permits roaming in many European countries. To use the Wi-Fi hotspot in the A8 as well as the new internet radio services, the customer also has the option of taking out attractive data packages. There is a separate area in Audi connect for the package Audi connect safety & service including vehicle scheduling. It covers the emergency call, online roadside assistance and Audi service request functions, as well as the remote services that can be controlled by app. All Audi connect functions are brought together in the new myAudi app. With its improved ease of use and functionality, it enables the customer to access all Audi content. The array of smartphone-based services includes for instance transferring points of interest to the navigation, music streaming via Napster or copying the smartphone calendar to the MMI. The app can also be used to lock and unlock the doors, operate the optional auxiliary heating and call up the status report. The customer can also call up the latter in the myAudi portal. In the event of theft, the Audi call center locates the A8 by remote access and disables the car if required. In addition, the car can attract attention by activating the horn and flashers, to help the police find it. The navigation likewise offers an array of new features – both optical and functional. The map has a new texture and incorporates highly detailed models of major European cities for an even more realistic representation. For route planning, the sedan with the self-learning navigation system gives its owner suggestions based on routes previously driven. It also draws on the system’s experience of driving times and traffic loads. The calculation is performed online on the HERE servers, which incorporate real-time data on the overall traffic situation. The extended point-of-interest view enables the driver to call up special locations straight from the navigation, such as filling stations and parking garages. They can also call up dynamic supplementary information such as current fuel prices, parking space availability or opening hours. Together with MMI navigation plus, they receive four free map updates per year. The myAudi app provides another new function called myAudi Navigation. This enables the driver to plan a route seamlessly across multiple devices, which is especially helpful in unfamiliar cities. To give an example: The app guides the customer from a restaurant to their car, which is parked a few streets away, then switches from the smartphone to the on-board monitor. When the customer gets out of their A8 at the end of their journey, it accompanies them again on their smartphone to their next destination. The Audi connect key offers a new way of accessing the car: A compatible android smartphone serves as an alternative to the familiar remote control key and also takes care of starting the engine once the car has been unlocked. The access data it requires is stored in a secure element on the SIM card or in the smartphone. When the driver holds their smartphone in front of the door handle, the data is transmitted to the car by near field communication (NFC). The Audi connect key is as convenient as it is secure. The user of the new A8 can issue the access data to four additional persons, for instance colleagues or family members. The key is operational at all times, even if the smartphone’s battery is flat (depending on model). For the concierge service or e.g. workshop appointments, there is an NFC-enabled key card the size of a credit card that allows the service provider to drive the car even if they are not in possession of the smartphone. Audi hosts the data on Group-owned, secure servers in the cloud. The latest crypto standards such as 256-bit encryption are used. The five possible drivers of the new A8 can save their preferred settings under up to seven user profiles. The scope for personalization covers up to 400 parameters, from the driver seat position and the preferred air conditioning settings to navigation destinations previously used and favorite media. The display views and the bulk of the assistance systems are also covered by personalization. The sedan identifies the individual user from the signal in the remote control key or Audi connect key as soon as the automobile is unlocked. It welcomes them by name to the Audi virtual cockpit and activates their profile. The driver can create several different personal profiles – such as a weekday and a weekend profile, or a freeway and a country road profile. They can switch between them while on the move. A coherent operating concept is hugely important, given the wide range of settings and options in the luxury sedan. The previous A8 models already featured the impressive MMI and MMI touch systems. The new model generation presents the next generation – MMI touch response. The operating concept revolves around a display with black-panel look. Its screen diagonal is 10.1 inches, the same as a tablet computer. With a resolution of 1,540 x 720 pixels, the gently curved TFT screen provides very sharp images and high contrast, even when viewed from an angle. The MMI touch response concept makes the touchscreen technology very reliable to operate thanks to a novel combination of tactile and acoustic feedback. When the driver touches the display glass with a finger, they do not activate a function straight away – they need to press gently with a defined pressure. By way of acknowledgment, they feel a gentle pulse generated by an electromagnet moving the display glass minimally sideways. At the same time a small loudspeaker emits a click sound. The touchscreen display thus gives the driver clear feedback: It feels authentic and now transfers the quality legacy of physical buttons and switches to purely digital instruments. The large display is used for controlling navigation, media and vehicle functions. The driver can click, swipe, zoom and scroll on it. The menu structure is intuitive and flat, like on a modern smartphone. The arrangement of the tiles in the main menu and the direct access bar can be configured individually. There is a second display with a screen diagonal of 8.6 inches and a resolution of 1,280 x 660 pixels on the center tunnel console. The driver uses this to control the air conditioning and the comfort features. They can also store favorites for their preferred functions, such as navigation destinations, radio stations, phone numbers or vehicle functions. They can rest their wrist comfortably on the tiptronic selector lever while operating it. The lower display also offers the driver the option of entering text – either via a keyboard or by handwriting recognition. The latter signals a quantum leap. Thanks to whole-word recognition of handwriting or on-the-spot writing plus acoustic feedback, the driver can enter navigation destinations or search terms particularly quickly and accurately without needing to look at the display. In the new, connected menu structure all Audi connect content is located directly under the corresponding function menus. That keeps searches simple and quick. When looking for a Chinese restaurant, for instance, a hit list appears as soon as just three letters have been input. It also gives Yelp rankings and can be sorted by various criteria. The fuel prices are given for filling stations. Alternatively there is the option of a Google search. The surface of both displays has a kind of anti-fingerprint coating. Fingerprints can now simply be wiped off. There is also an anti-glare layer that refracts the reflected light. This makes reflections fuzzy, reducing their interference. The outermost layer is tempered, similar to the Gorilla glass used on various smartphones. It is very strong and extremely scratch-resistant. The new A8 answers its driver’s questions in two ways. First, it uses its own information on the user’s preferences that the vehicle has remembered; and second, it draws on knowledge in the cloud. This seamless connect experience also applies to voice control. It enables the A8 to engage in intelligent conversation. The driver can phrase their instructions however they choose – the data package for these is run through recognition software. The self-learning dialog manager responds, asks queries if need be or offers selection options. If the network signal is good, the answer takes less than two seconds to arrive. In dialog with the system, the driver can switch between the menu areas, for example call a contact from the phone book and use the associated address as a navigation destination. Over and above performing destination searches, the new hybrid voice control also covers the media, the air conditioning and certain telephony functions, plus some Audi connect services. It functions across borders in Europe. As well as the MMI touch response displays and hybrid voice control, the new A8 has a third control level, the multifunction steering wheel. The driver uses it to call up all driving and vehicle information; they can also activate the primary infotainment functions. The information is routinely displayed in the Audi virtual cockpit. Its 12.3-inch TFT monitor, which is fed by a separate K1 computer unit by NVIDIA, provides a brilliant full HD resolution of 1,920 x 720 pixels. The driver can choose between two interfaces, both of them with a modern look. In the classic view, the virtual instruments are similar in size to analog displays. Between them is a window in which the navigation map or telephone, radio and audio lists are displayed. In Infotainment mode, this window is maximized and the speedometer and rev counter are correspondingly reduced in size. The optional head-up display projects information relevant to the driver as symbols and numbers that can be quickly perceived within the driver’s direct field of view, including speed, navigation messages and information from certain assistance systems. A TFT screen and two aspherical mirrors project it onto the windscreen in a field measuring 217 x 84 millimeters (8.5 x 3.3 in). It appears to hover in a window about 2.3 meters (7.5 ft) in front of the driver. Because the eyes are focused for distance vision, they can register its content especially fast, minimizing any driver distraction. 5,172 millimeters (203.6 in) long, 1,945 millimeters (76.6 in) wide and 1,473 millimeters (58.0 in) high – these are the dimensions of the new A8. It is 37 mm (1.5 in) longer and 13 mm (0.5 in) higher than its predecessor model, but the width is marginally lower. The wheelbase is 2,998 millimeters (118.0 in) (+6 millimeters / +0.2 in). In the long-wheelbase version, this dimension and the overall length gain 130 millimeters (5.1 in), while the height puts on 15 millimeters (0.6 in). On both body versions the track width is 1,644/1,633 millimeters (64.7/63.3 in) (front/rear). The passengers benefit from the increased dimensions – the new A8 has the biggest interior in its class. On both body versions it has grown in length by 32 millimeters (1.3 in). On the A8 L, there is also more headroom, shoulder room and leg room. The two-section panoramic sunroof gives its interior a more open effect. The luggage compartment has a capacity of 505 liters (17.8 cu ft) on both the A8 and the A8 L.
Aluminum, steel, magnesium and carbon fiber reinforced polymer (CFRP): The new A8 uses more materials in its supporting body structure than in any previous Audi production model. The luxury sedan’s torsional rigidity, the critical parameter for precise handling and pleasing acoustics, represents an improvement of up to 24 percent on the predecessor model. Audi is a pioneer of lightweight automotive construction: The original A8 from 1994 was the first volume-built automobile in the world to have a unitary aluminum body, the Audi Space Frame (ASF). Since then, the brand has built over one million cars using that technology. 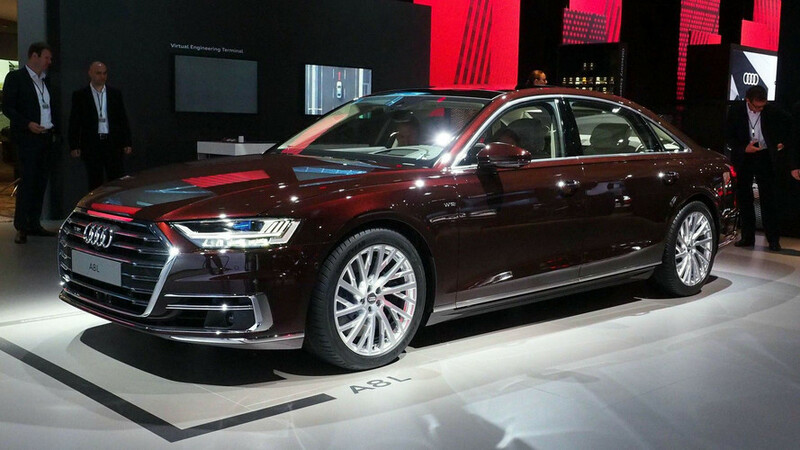 The body of the new A8 likewise adopts the ASF principle. It is made 58 percent from aluminum components – the classic structure of cast nodes, extruded sections and panels. Their strength has been considerably increased compared with the previous model. The cabin consists of hot-formed steel components, complemented by an ultra-high-strength, torsionally extremely rigid rear panel of CFRP. To absorb the loads and shear forces optimally, the fabric layers in the latter run in different directions, as many as 19 of them criss-crossing. A magnesium strut-tower bar completes the lightweight construction concept. The new A8 leads its class with finesse in every area of aeroacoustics, too – especially the mirrors and door seals. In addition to sophisticated mounts for the axles and assemblies, the glazing plays a pivotal role here. The optional acoustic glass improves soundproofing still further. Audi uses 14 different joining techniques to assemble the multimaterial body, including hemming for the door sills. This technology is used to join the aluminum side wall frame to the hot-formed steel sheets at the B-pillar, roof line and sills. It is the very basis for their use. It also results in very narrow flanges and in correspondingly large, convenient entries. Every operating process in the new A8 is easy – even opening the doors. The hand merely need pull the exterior handle through five millimeters (0.2 in) – a microswitch then releases the catch. A few millimeters is likewise all that is required to open a door from the inside. In an emergency, the doors can be opened mechanically from either inside or outside by pulling Bowden cables vigorously. Audi can supply the electric door lock with the option of a power-latching feature. The luggage compartment cover automatically swings up as standard when released. An electric drive is available as an option. Opening and closing are triggered off here at the push of a button or by foot gesture – in combination with the convenience key. Freedom is the defining design feature with a new luxury slant. The new A8 therefore appeals to all senses and blends impressions into a coherent composition. This starts with the very shapes and lines of the interior design, but also extends to the authentic materials of superlative bespoke quality, and culminates in the prepossessing audio experience of the high-end sound system and the subtle lingering impression of the fragrancing. The lounge character presented by the interior of the new A8 owes much to the newly designed seats. They are much lighter than on the previous model – the front seats alone trim over four kilograms (8.8 lb) off the weight. Glass fiber-reinforced polymer (GFRP) is used in the rear seats. At both the front and rear, the structure of the seat cushions and backrests with a variety of shaped, comfort and flexible foam layers afford excellent comfort and good lateral support. Audi supplies the front seats in various different versions. The top version is the comfort customized contour seat. In addition to pneumatic seat and backrest side bolster adjustment, it also comes optionally with heating and ventilation, each with separate three-stage control. The developers have also significantly extended the optional massage function. In each backrest there are 16 small bubble-shaped air pockets, in threes on top of each other. They massage the entire back in a choice of seven programs and three intensity levels. A small compressor on each seat exerts up to 0.5 bar of pressure. Both A8 body versions – standard and extended wheelbase alike – are built as standard with a three-person rear seat, optionally with through-loading facility or cool box. The outer seats can also be supplied optionally with heating, plus electrical adjustment of the fore/aft position, seat angle and backrest angle. The lumbar support is then pneumatically adjustable. It can likewise be supplied with a massage function with 18 triple air pockets per seat. Comfort head restraints and rear roller blinds add the finishing touches to a sense of relaxed travel. Audi also supplies the same adjustment options as for the three-person rear seat bench for the individual seats in the A8 L with long, continuous center console. It provides an armrest and large storage compartments. First-class travel: the relaxation seat The first-class solution in the new A8 is the relaxation seat at the rear right. Its occupant can recline it and rest their feet on an electrically folding surface on the backrest of the special front passenger seat. This provides the option of having the feet warmed and massaged with multiple settings. There are three power levels, two programs and three foot sizes to choose from, also providing full-surface reflexology. The rear passengers can relax their heads against the soft comfort head restraints, which here have electric height adjustment. The relaxation seat package comprises the comfort customized contour seats with ventilation and massage, the long center console with double folding table, the rear seat remote operating unit, Rear Seat Entertainment and four-zone deluxe automatic air conditioning. The thermal comfort packages, a supplementary option, heat the armrests in the doors, the front and rear center armrests, as well as the steering wheel. Audi has created the compact rear seat remote especially for the rear compartment. This device resembling a smartphone allows the passengers to operate an array of climate control, seat, lighting, adjustment and media functions via its touchscreen. The device also acts as a convenient remote control for the Audi tablet if the latter is fixed to the reverse of the front seat. Communication with the MMI navigation plus is by Wi-Fi on the new 5 GHz band. The rear seat remote has a 5.7-inch touchscreen display in OLED technology with full HD resolution. Its aluminum case is very high-quality, and the technology with the T40 processor from NVIDIA is made to withstand the very high temperatures that may be encountered inside the car. The rear seat remote clips into and is charged in the center console on the four-seater A8 and the center armrest in the five-seater. Depending on the rear equipment specification, it is supplied as standard or an option. The two Audi tablets of the Rear Seat Entertainment are equally exclusive and sturdy. Their 10.1-inch screens have a full HD resolution and the processor is by NVIDIA. The Audi tablets communicate with the MMI navigation plus and the rear seat remote by Wi-Fi. Their users can enter navigation destinations, select media or surf over a Wi-Fi hotspot. The Audi tablets also provide access to the world of Android, complete with the Google Play Store. After a journey, they can continue to be used away from the car on any Wi-Fi network. It also could not be more convenient to handle phone calls in the new A8. The sedan allows two mobile phones to be connected and used alternately. The MMI navigation plus can save over 4,000 contacts. For the rear, a separate Audi phone box is available for the four and five-seater versions alike. It pairs the passenger’s smartphone wirelessly with the car aerial for guaranteed best reception. It also charges it inductively using the Qi standard. In conjunction with the rear seat remote operating unit, the rear passenger can in addition make phone calls discreetly. Audi has three sound system offerings. Topping the bill is the 3D Bang & Olufsen Advanced Sound System, now also available for the first time in the rear. An efficient amplifier controls 23 loudspeakers with 1,920 watts; their neodymium magnets produce an airy, high-resolution sound pattern. Precision-perforated aluminum elements adorn the bezels of the door loudspeakers, while LED light guides emit white light. The lens tweeters in the instrument panel are extended electrically – a modern classic feature of Audi. Four full-range loudspeakers in the A-pillars and in the roof line take care of the high-level spatial dimension. An algorithm computes the signals for them. It is based on a method that Audi has developed jointly with the Fraunhofer Institute. The sound impression makes the interior a world of acoustic experience where the music unfolds exactly how it was recorded in the concert hall. As an option Audi equips the new A8 with a digital audio tuner for DAB and DAB+. The optional TV tuner equally operates digitally. Its CI+ module permits reception of encrypted channels via a smartcard. The new A8 offers its passengers a thoroughly agreeable climate including when it comes to air – especially with the optional air quality package. This includes fragrancing distributed non-centrally throughout the interior using the air conditioning system’s outlets. The instrument panel conceals two vials containing a hint of sea breeze or mountain air. The customer can adjust the level of intensity of the fragrancing over four stages. The ionizer is also part of the package. It charges the molecules of the interior air electrically with negative ions. These anions attract dust and similar minuscule particles; these then form mini clusters which fall to the floor so are not inhaled. Next year, a particulate measuring sensor will also be introduced for specific markets. It determines the level of particulates in the ambient air and compares this reading with the air inside the A8. Filter efficiency is displayed on the on-board monitor – an important service especially for customers in urban areas. The standard air quality sensor also detects harmful gases and activates recirculated air mode as necessary. The filter in the four-zone automatic air conditioning eliminates the bulk of these gases and particulates, and also neutralizes many allergens.